Game of Thrones season 8 episode 1 was always going to be a table-setting episode, but it nevertheless built up to a major reveal — for a character, not the audience — while stitching together some lovely, heavily-anticipated reunions along the way. (It even ended with one, which called back to the show’s first ever episode.) And the big character moment was set up in fine fashion as well, by using narrative blocks that pushed the story forward, in combination with some shots that added to the humour quotient of the episode, a necessary inclusion given the grim nature of what’s to come. Spoilers ahead for Game of Thrones season 8, episode 1. Game of Thrones season 8 episode 1 began, predictably, with Dany and Jon’s arrival at Winterfell, riding together with their combined forces that include the Dothraki, the Unsullied, and two full-grown dragons. Tyrion pitched said strength in an assertive fashion to those gathered in the common hall, hoping to win over the grumbling Northern allies who aren’t happy that Jon has given up his crown so soon, by noting that they had assembled “the greatest army the world had ever seen”. That should give them a good chance to fight the imminent threat of the Army of the Dead, the Lannister said in the home of the Starks. But there’s another side to numbers as well, as Sansa pointed out: how we do feed them all? She prepared her winter garrisons for the men they had, not the ones Jon decided to bring. The back-and-forth established the important puzzle pieces for the time to come but it also established that there might be too many authority figures at Winterfell. Something that was straightforwardly obvious when young Lord Umber — who dies at the hands of the White Walkers later on — had to dispatch three greetings one after another: ‘my lady’ for Sansa, ‘my lord’ for Jon, and ‘your grace’ for Daenerys. For Jon, such concerns are “not important”, something young Lyanna Mormont doesn’t take kindly to. They all named him King in the North; how dare he term it not important. Jon, obviously as usual, wants people to rise above such petty concerns so they can prepare for the Great War. But despite his attempts, Jon is further dragged into the debate towards the end of the episode, but not before he has some fun. Dany is informed that her dragons aren’t eating enough — only eighteen goats and a dozen sheep, oh boy — and she goes to check on her babies, naturally. And just like he did at Dragonstone, Jon has another little bonding moment with Rhaegal. (The poetry is everywhere. He doesn’t know yet that the dragon is named after his father, but it’s not far away.) But this time, it’s different. Dany gives Jon permission to ride the second of her remaining dragons, having already climbed Drogon, and the former King in the North is taken aback. After a bit of a humorous exchange between the two, Jon manages to seat himself and clinging on to dear life, as Rhaegal takes off. It’s a total fan service moment but it’s also the first step in an essential journey. If they are to fend off the White Walkers, they need dragon riders. After Jon learns a bit of control and sets Rhaegal down near a waterfall, he remarks that Dany has ruined horses for him for good. The two lovers then share a kiss, but not after Rhaegal has given Jon massive side eye. Can dragons smell a Targaryen? Dany probably believes that Jon could ride her dragon because she allowed it, but it’s entirely possible that dragons only accept those of Targaryen blood. If that’s the case, it’s not something the dragon queen seems to be aware of. But more importantly, Rhaegal glaring Jon comically sets up the moment that’s about to come: Sam telling Jon about R+L=J. 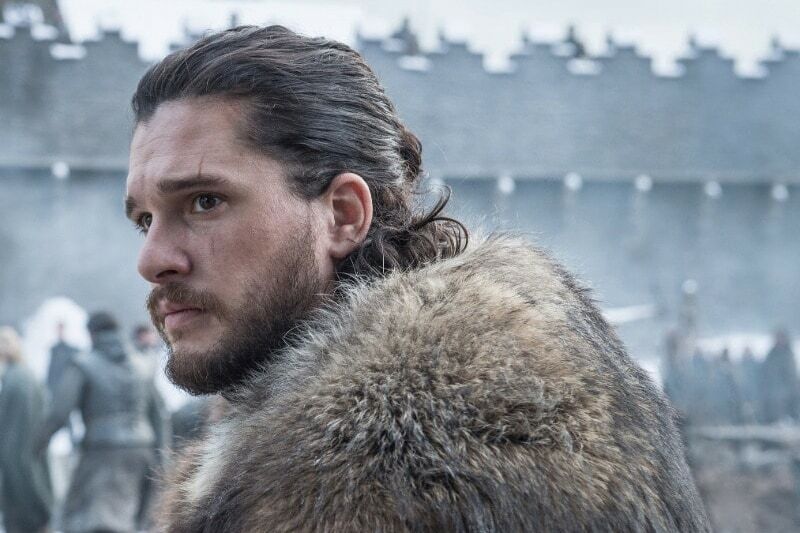 For those that have forgotten, Jon is the trueborn son of Rhaegar Targaryen and Lyanna Stark, which makes him the proper heir to the Iron Throne. Sam says as much after meeting Jon down in the Winterfell crypts, though it’s likely not in the most elegant fashion. Him learning about his family’s fiery demise at the hands of Jon’s lover might have something to do with that. Jon refuses to believe Sam initially, noting that he’s calling his father Ned Stark a liar, but Sam then properly fills in the blanks, leaving his best friend shell-shocked. But Daenerys is our queen, Jon says. Well, you’re the one true king, Sam replies. Also, your’s name Aegon Targaryen. The entire episode feels engineered in parts to build up to this big moment. A dutiful man, who doesn’t care about titles, realises that he’s in line for the greatest responsibility in the land. But it’s not just that simple. It also affects him much more personally, given he’s in a fledgling relationship with another Targaryen, his biological aunt, whom he’s pledged fealty to. It’s bound to send ripples across the surface, but knowing Jon, he may well decide to not tell anyone. But the truth has to come out at some point, surely, and it’s going to make for a right mess when his family, the Starks, and the Northerners realise that they have two Targaryens in the midst. And they named one of them the King in the North, who’s actually the grandson of the guy — Mad King Aerys — who executed their leaders not long ago and belongs to the family that took away the North’s wish to self-rule in the past.